As the name suggests, the Japanese maple is native to Japan. It was brought to the United States in the beginning of the 1800s. There are numerous cultivars of this tree, each with their own distinctive characteristics, such as size, color, and shape. This deciduous tree is often used as a specimen planting/focal point or as a border shrub in landscape design. The Japanese maple can be either a deciduous small tree or spreading shrub dependent upon which cultivar is chosen. As a shrub it does not have a single leader but several trunks, which are joined together at soil level. Heights vary from 6 to 50 feet, although most mature species reach heights of from 15 to 25 feet. The color of the leaves also varies from cultivar to cultivar. Some cultivars have purple-reddish leaves throughout the entire growing season. Other cultivars have red leaves only in the spring and fall (they are green in the summer season). Japanese maple trees are hardy in zones five through eight. This tree does well in full sun to partial shade. It requires highly organic soil that is moist and well-drained. Rapid growth can be expected when the tree is young, growth tends to slow down as the tree matures. Japanese maples need to be protected from drought conditions and will need to be watered frequently. Lack of water leaves the tree susceptible to disease, such as fungal cankers. Verticillium wilt disease is common among Japanese maples. Symptoms appear the same as symptoms from drought conditions. However, verticillium wilt is caused by a fungus known as Verticillium dahliae. This fungus is present in the soil as well as in the roots of an infected tree. The fungus spreads when: infected pruning tools are used, when the soil is tilled, and by water irrigation. When a tree has verticillium wilt you will notice a wilting and sticking of leaves on its branches. The disease will progress to other branches, and it can kill the tree. Since there is no known control or treatment of verticillium wilt, the only way to manage this disease is to avoid planting in an infected area. This is another disease that begins below ground level, it is associated with wet planting sites. It is fungal in nature--the fungus attacks the fine roots of the tree or shrub. Fine roots die off, and the fungus then spreads to the larger roots. Eventually the fungus reaches the root crown. The disease then spreads up through the stem/trunk destroying the stem and root tissue. Symptoms are chlorotic leaves. In some instances above soil symptoms do not even appear. Prevention is to keep your tree or shrub healthy. 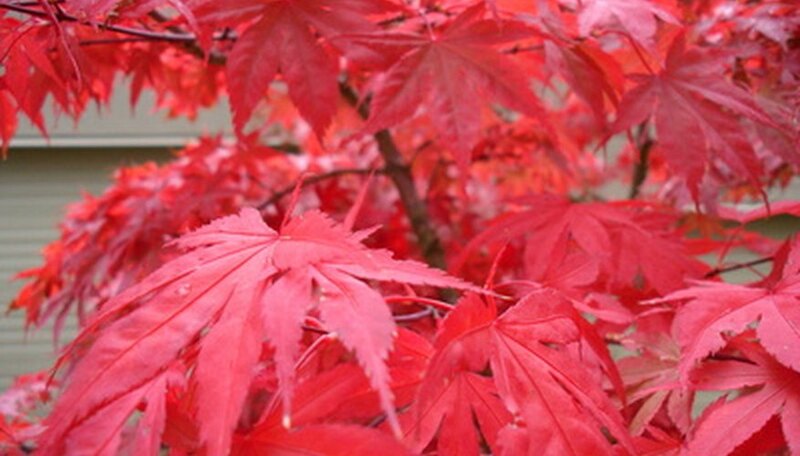 Be sure to plant the Japanese maple in a well-drained area, and do not overwater. Japanese maples can be attacked by leaf feeders such as the Japanese beetle and scales. The scales that may attack are cottony maple, cottony camellia, oleaner and cottony taxus scale. Aphids may also feed on the leaves of the Japanese maple. (Insecticides are available to rid your tree of these pests.) The best defense against pests and disease are a healthy tree. Plant in highly organic well-drained soil, provide a sunny location, and follow a regular fertilization program.